Biodegradable, bamboo serving sets that feature adorable hand-drawn creatures with stylish and sweet details? We (and our little eaters) are in green design heaven! 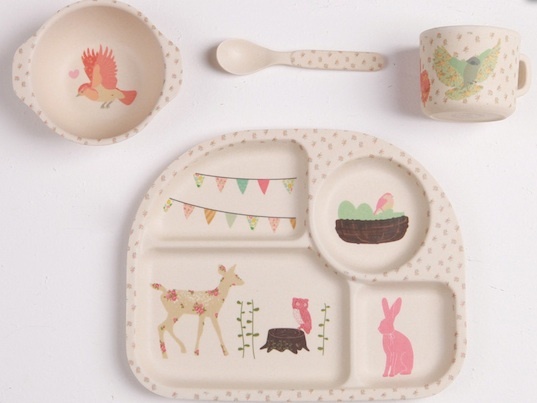 Etsy store Love Mae, known for its eco-friendly wall decals, has three ridiculously cute versions of its dinnerware sets: farmyard animals, forest animals, and a woodland tea party featuring birds. The sets each come with a divided plate, a small bowl, a cup with a handle, and a spoon, so your little ones are covered for every meal and snack. Free from BPA and phthalates and top rack dishwasher safe, these sets would make an awesome shower gift or first birthday present. Truth be told, the designs are so endearing, we wouldn’t mind stocking up on an extra few sets and eating our meals on them as well! These are absolutely adorable! She has some amazing items! Biodegradable, bamboo serving sets that feature adorable hand-drawn creatures with stylish and sweet details? We (and our little eaters) are in green design heaven! Etsy store Love Mae, known for its�eco-friendly wall decals, has three ridiculously cute versions of its dinnerware sets: farmyard animals, forest animals, and a woodland tea party featuring birds. The sets each come with a divided plate, a small bowl, a cup with a handle, and a spoon, so your little ones are covered for every meal and snack. Free from BPA and phthalates and top rack dishwasher safe, these sets would make an awesome shower gift or first birthday present. Truth be told, the designs are so endearing, we wouldn't mind stocking up on an extra few sets and eating our meals on them as well!